29 elementary and high schools in California are participating in a program to substitute energy-efficient compact fluorescent light bulbs (CFLs) for conventional incandescent bulbs in students' homes. The immediate goal of the exchange program was to substitute some 4,000 CFLs for incandescent bulbs during the 2006-2007 school year. The program's long-range goal was to swap 12,000 bulbs over three years. But the energy- and money-saving idea caught on so well that in just four months -- and with just nine schools initially participating -- schools had to scramble to keep up with the demand for CFLs. When the dust had settled, more than 8,000 bulbs had been swapped in the fall semester alone. Now in addition to the original nine, 20 more schools are gearing up for bulb exchanges during the spring semester, with the potential of exchanging several thousand more CFLs and surpassing the 12,000 three-year goal in only one year. Based on these numbers, students in the nine participating schools have already saved more than $400,000 in overall energy costs for their families and about 3 million kWh over the lifetime of the CFLs. Alliance's Green Schools California program. "For example, bulb exchanges have been conducted not only during classroom science projects, but also as part of school-community activities like parent nights, science fairs, and PTA events. The Green Schools CFL program is made possible by Southern California Edison (SCE), which provided the energy-efficient bulbs. The program is funded by California utility rate payers and administered by Southern California Edison under the auspices of the California Public Utilities Commission. Doesn't this project want any of my readers to start a project in there area? It only takes one, bring it up with the PTA or your principal. While fluorescent lamps save energy, they contain hazardous substances that if released into the environment will cause great damage. Even being too close to such a lamp when it breaks can pose great risks to one's health, for it contains mercury vapours. Not many people know that such lamps need be disposed in a special way and cannot just be thrown in the thrash bin. I've never seen this mentioned anywhere, not even on the lamps cases! Oh really!!! Maybe Fabio would like to provide a calculation to support his fear mongering. Take the amount of mercury in a CFL and divide it by the size of the room that you might break the bulb in. Now consider the threshold of harm from mercury from mercury exposure. If anyone is concerned with mercury exposure the EPA has a good web site on how to clean up small spills and when to call the hazmat team. If you happen to break and old mercury switch or barometer, you definitely need to clean it up correctly. Keep in mind that while mercury is ubiquitous in the environment, disposal of mercury above a threshold limit requires special training. Since buying CFLs do not require this training, the amount of mercury in CFL is not significant. - Unlike the Hg released by burning coal, there's a decent chance the Hg in a CFL won't make it's way into the environment. This Wikipedia article has a good summary of that issue. - CFLs, I understand, contain ~5-6 mg/Hg per bulb (verification/correction would be welcome). This is not a lot, but of course > 0. I am further led to believe that common items like many household thermostats and watch batteries contain a lot more Hgs. In many (most?) areas, there are mechanisms for processing these types of items. I know there is in my town. - I don't have a CFL in front of me, but I seem to think that most packaging and bulbs do in fact allude to their mercury content and say something about proper disposal. There is an interesting problem here. 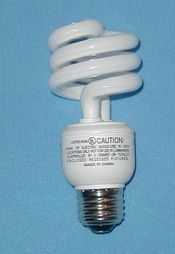 The right thing to do is to make clear to purchasers that CFLs need to be disposed of properly b/c they contain mercury. But there is a pitfall that some or many consumers may over-react (my opinion) to the presence of Hg in the CFLs and not buy them, despite the reality (in my opinion) that CFLs do not pose a significant health risk. That said, I'm quite interested in further LED development and GE's proposed high-efficiency incandescents. I love CFLs, and 90% of the lighting in my house is CFL, but I really would prefer not to bring even teensy amounts of Hg into my house. But on balance CFLs are A Good Thing, at least for the time being. Simply put: there's *no* safe Hg levels, because Hg accumulates in the environment and bodies. Yes, we're surrounded by Hg, even in fishes, however this doesn't mean we can put even more Hg in the environment just because there's already so much of it. That said, I too have CFL's in my house, but I am aware of the issues and I'm amazed that no one ever talks about them. Yes, I've read the wikipedia entry that says that the combined hg leves from lamps and electricity production is lower for the CFL's, still that actually depends on how electricity gets produced. All in all, I just wanted to provide thorough information about the CFL's. Simple put, there is a safe level of Hg. There is a threshold below which no harm is detected. Hg does bio accumulate. You are more likely to find higher levels of mercury in old fishermen than pregnant women. This is a issue that I have studied. I am not aware of any cases of Americans being found with high of Hg that was not attributed to a specif cause rather than a general environmental problem like burning coal. I have a friend who suffers from mild mercury poisoning. Growing up in the third world, he recycled batteries to feed his family. Now he has a phd in physics. Anyhow, lots of scare mongering, no smoking guns. It does bring up the interesting concept of the unintended consequences of conservation. When indoor air pollution results from not enough fresh air, we might want to think about wasting a little energy. Excuse me, you said it yourself: mercury does accumulate. That's the point: by accumulating into the body, even at small doses, mercury causes low lever chronic intoxication which has a quite different behaviour than acute intoxication, and that's why it often doesn't get detected as a mercury intoxication at all. Other heavy metal poisonings undergo the same treatment, unfortunately. One of the chronic mercury intoxication sympthoms is the fatigue syndrom, for instance. Also, mercury intoxication causes damages to the immunitary system, something which opens the door to a series of other "unexplicable" ilnesses. It's not a mistery that environmental pollution causes all sort of diseases, so does mercury. The literature is full of references and studies about this. From State of Michigan Department of Environmental Quality: An extremely small amount of mercury—an average of four milligrams—is sealed within the glass tubing of a CFL. Disposal - Some communities offer disposal or recycling programs that accept fluorescents. Check with your local or municipal government entity responsible for solid waste or household hazardous waste collection. • Disposal through the household hazardous waste collection is preferred but you can lawfully dispose of CFLs in your household garbage. To reduce the risk of bulb breakage or contamination and to protect yourself and the garbage staff from cuts, wrap the bulb in a sealed plastic bag and discard it with your trash. • Never incinerate CFLs (or any other mercury-containing materials for that matter). • If your bulb breaks, your greatest risk actually is being cut by broken glass. Handle it sensibly and be certain to sweep up all the glass fragments (don’t vacuum, because that can disperse particles). Place the broken pieces in a plastic bag and wipe the area with a damp paper towel to pick up any stray shards of glass or powder. Keep CFLs working for the environment. This information is essentially the same as on the EPA Fact Sheet. The Phillips Extreme Low Mercury CFL's have less than 2 mg of Hg, which are now their standard bulb. Jim, the fact that burning coal releases mercury in the environment is just a reason to not use coal, certanly not a reason to feel free to play with mercury at one's will. Just wanted to highlight the fact that CFL's contain mercury, which never gets mentioned anywhere. We'd all be better off by using LED's, instead, which require even less power and last so much longer than CFL's, while polluting much less. Why this rush to buy CFL's when there's better technology around? I hardly see LED's mentioned anywhere in the news, as substitute to incandescent bulbs. Fabio, what you are doing is irresponsible fear mongering to further your agenda. There is a responsible way to protect people and the environment from heavy metals. Part of the protection plan is to randomly test people for heavy metal. There is not a person in th world whose body does not contain plutonium, lead mercury, arsenic and other heavy metals. Therefore it is necessary to determent the level at which there is adverse affect. We then set drinking water and air quality standards based on very conservative criteria. I am happy to say that the CDC random testing found no one in the US above the level of harm threshold for Hg. However, some samples were within the criteria for concern which is set lower by 100. This is to say that some are at risk for being at risk so we should carefully monitor the risk and look for ways to further reduce the risk. There is a concept in environmental protection called ALARA (as low as reasonable achievable). It would look like CFL are a reasonable way to reduce HG. The lowest cost solution is the on/off switch. How many CFL bulbs have you broken? I am particularly concerned for your welfare, because EVERY SINGLE article that I have seen notes that CFLs do contain mercury and every bulb I've purchased (over 150 so far) stated on the package that the bulb contained mercury (sometimes abbreviated Hg.). This is not some secret conspiracy to insinuate mercury into your den. Should people be concerned that their light bulbs contain mercury? Yes. They should be concerned enough to handle them with care and dispose of properly. The interesting thing is that most people don't even realize that an average incandescent bulb releases at least 5mg of mercury into the atmosphere (assuming 50% of US power generated from burning coal) over the years they use them. Further my agenda? What would my agenda be? Are you implying I sell LED's, by any chance? Guys, I'm simply stating facts. CFL's contain mercury. LED's consume even less energy than CFL's. Do your math. Perhaps it's not me who's furthering an agenda, hm? Look at the picture presented in this article: there's a "Warning" writing on the lamp, however it's not about it containing mercury. I've never seen any mention of CFL's containing mercury anywhere - perhaps I just haven't looked well enough, yet if I haven't seen it chances are so many more people haven't. I can assure you that I if I asked anyone I know if they are aware of the fact that CFL's contain mercury and need to be disposed of in a special way, the answer I would get would be a loud "No?" Alot of people still don't know CFLs contain mercury and it's good to point that out. However since they save way more mercury from beeing released into the atmosphere than they contain they are the better choice. When they are returned, as they should be, that mercury won't even be released. It's a matter of making people know. It's not ideal but until there actually is an even better choice this is the way to go. LEDs are nowhere close to beeing as efficient as CFLs yet! We tend to think that because of the media coverage on what they are suppoed to become. Unfortunatly the reason there is so little mentioning of LEDs as alternative to regular bulbs simply is that they are not. Find some LEDs in stores and look at their specs. Phillip wrote: "Unfortunatly the reason there is so little mentioning of LEDs as alternative to regular bulbs simply is that they are not. Find some LEDs in stores and look at their specs." Jim, thanks for this post. My mother is a middle school teacher in Beaverton, Oregon, and her students have been doing exactly this kind of program over the past several months. They're selling CFLs that they got from the Energy Trust of Oregon for a low price. Half the price goes to pay back the ETO, the other half goes to fund global warming awareness projects/programs the students are doing. I remember older CFLs that contained not just mercury, but also a radioisotope of krypton or promethium (to provide sufficient ionization to allow the bulb to start, I imagine). The energy crisis has never been before this much worse. Several talks had been made in the past decade about energy conservation. Dozens of research had been funded for the development of energy efficient household devices. But no matter how efficient those gadgets are they still consume power. The best solution is self discpline. We must how to limit our usage of appliances and be able to turn off unused lights and other electrical equipments. I recently created a website and researched how much money we waste on average by living like we normally do. So I gathered up as many tips as I could that show how anyone can greatly reduce the amount of energy they consume and save a lot of money. What is the problem, California is "on the top on the environmental movement", get on the stick and stick it to the utilities and retailers to recycle the bulbs!! Buy one, recycle one and wrap it into the cost of purchase. My 7th graders just got the 6 Puget Sound McLendon's to join the Puget Sound Take It back Network, it can't be that hard for a bunch of committed California types to do this. Let's go and get off your duffs! The reason LED's are not being mass produced is because they last forever! No replacements. Bad for business. I hope someone starts manufacturing them. The first to do it will make the others follow suit. Supply and demand. Is there enough presure from the consumer? It's the same as with car manufacturers, when the pressure for efficiency builds up, they suddenly come up with an "innovation" to keep people happy. They are not stupid, if a technology is not going to make them money on the sale and aftermarket (or consume other products like fuel) why bother? I am looking for some plans/schematics to create a display that shows the difference between an incandescent and a CFL. Any ideas? This is a good idea but money could have been better spent on geothermal. It is more likely to last longer than the life of a bulb. I really appreciates these kind of programs. they feel the problem which will we all faces in our future. want to say good luck to California School Project, carry on,. On a odd little note: Tesla coils energy and relight any compact fluorescent bulb. Depending on how efficient and how much energy the coils use determines energy use. I got one of the coils from a cheap Wal Mart lightning globe and used it on some burnt out light. It worked to some extent lighting my room some but It need a better ground to get more energy and light out. This is an efficient innovation. This saves energy than incandescent bulbs. STEINEL Occupancy & Motion Sensors / Lights with inbuilt sensor. Primarily sensors are used for energy conservation which we believe would be widely welcomed for various applications in common areas like: Toilets, Car Parks, Lobbies, Corridors, Cabins, warehouse etc.. Principally, these sensors operate on human presence and ambient light conditions and have the capability to handle multiple electrical fixtures with a single sensor installation. You can even control your Air-conditions using these sensors. C-501, Remi Bizcourt, 9, Shah Ind Estate, V.D Road, Andheri (w), Mum - 53.
this is a great project for the science class, im going to use this idea, I think its going to be awesome!!!! A lot has changed in the lighting industry since the late 19th century when Thomas Edison invented the means to conduct light electrically through a bulb. Through decades of technological advances, the world at large is in a position today to gradually phase out incandescent, standard light bulbs and adopt new, more energy efficient means of lighting their environments. This is indeed a wonderful idea. If we will be able to eliminate the use of CFL's, imagine how much we can save on power. Not to mention that there are green.